Chris Slade has confirmed that he has returned to AC/DC as they prepare to perform at the 57th annual Grammy Awards in Los Angeles Sunday night. Slade first joined AC/DC in 1989; he appeared on 1990’s “The Razors Edge” but quit in 1994 when the band brought back longtime sticksman Phil Rudd – who he has now replaced. 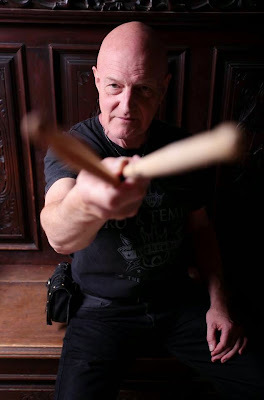 Rumours surrounding the drummer’s return surfaced this past week when his Los Angeles optometrist hinted that “big news regarding Slade and his career” was coming after he was forced to reschedule a publicity appearance with the drummer originally planned for Saturday. He adds: "We apologize for the secrecy. Please understand this was for all the right reasons." Rudd appeared on AC/DC’s latest album, “Rock Or Bust”, but missed an October video shoot in London in advance of his November 6 arrest on multiple charges by New Zealand police – including possession of methamphetamine, possession of cannabis and threatening to kill. This week, Rudd’s court case was adjourned to April due to a change in lawyers.